Before you read the following, watch the video as I explain Why I think learning string figures is of vital importance for all young people. In my old age looking back at my career as an educator my dream for the future is that young people will be focused on being able to maximize their potential and thus have a better life for themselves and their children. Education is the vehicle for their betterment. The brains of all people are changing all the time, but especially when they are young and most able to learn. String figures should be a core curriculum for all grade schools and middle schools, and it should be an elective in high school for true mastery of the subject. The hands (especially when engaged in intricate finger patternings) are a remarkably useful tool for the flowering of the brain’s potential. •	Children and teenagers who participate in learning activities using the hands (playing instruments, learning string figures, etc.) do much better in learning all other subject matters than those who have no such experience. I taught in Fiorello La Guardia High School of Music and Art and the Performing Arts in New York City, and the instrumentalists tended to be the best all-around students. •	It is crucial that this training start early and continue throughout the time period when the human animal is predilected to learn (say 4 to 24). •	In my opinion the brain’s explosive growth in the evolution of humans was first led by the hands and only later by the throat, tongue, and larynx speech acquisition. 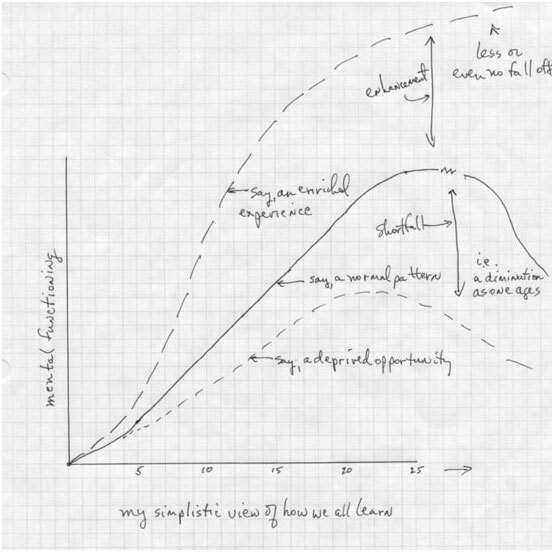 Below you will find my graphical representation of what I feel about how we all learn. The first four years are for preparing the basic systemic neuronal capacities; then comes an extended time for specialized learning. This period of time is necessary for all the complex modalities of the adult human to become fully developed. It is crucial that there be a concentrated effort in learning how to learn and learning the richness of man’s cultural heritage. We all like to be smart, but learning new things can look to be too hard unless one has a history of successful learning to give the courage to persevere into new challenging spheres. So it is crucial that we try to impart a truly successful accomplishment in learning early on. Children should learn instruments and make music. Children should learn string figures. There is a disconnect, however, between the educational system and the students. Children have succeeded in slowing down their collective learning, with the quiet collusion of the staff. A child has to feel and understand he or she has grown into a competency that works. Telling them they’ve done it doesn’t work. They must internalize a respect of self for becoming able to show their talents, talents they must expect from themselves. Most of this argument is classic recommendation for hard work and effort, but it is my contention that playing music and/or making string figures is an addictive challenge which intrigues enough to call forth concentrated extended effort at success, and that this effort will be rewarded with a self pride that will carry over into other learning situations, and a practiced learning mode can be adopted in the new subject. One of the intriguing aspects of this is the fact that one has many more synaptic connections at the beginning of the learning process than one does at the end. The learning is manifest by deepening and thickening the connections formed by experiences. The unused or underused connections are lost. Think about losing connections without thickening those that remain through study and use, or losing the ability to develop avenues of thought for having never experienced them through the learning process to begin with. There is a joy of discovery that each of my students has talked to me about. They are the ones I’ve relied upon to expand the sense of making string figures so it is as rich a system as I can make it. It is they who constantly surprised me with new methods of imagining figures, and it is for them that I am telling you what we jointly developed as a self-learning tool. This tool teaches you how to learn and develop that focused, recording sense of mind that the pre-literate existence demanded as a discipline in order to survive. These societies had tools of training the mind to remember, and training it to order and develop the sense of these memories. They emphasized that one should become a repository of knowledge, an elder who remembers. You should practice physicality and you should practice mentality. You should work at becoming the best that you can be. Thus the question becomes, how do you do this best? I teach a way of playing with the hands and a circle of string to accomplish both these things at once. First you practice a hand’s dance with a habituation of complex physical pattern as physicality, and you practice as mentality a simple language to keep order in this, a difficult-to-memorize activity. And it is in the simultaneity, the fusion of these two activities that the experience will teach you to pay attention to how you learn and remember things that you yourself choose to retain, to keep as memory. Adults of today who know string figures at all probably think of them as a child’s game that they knew when you were young, but have now forgotten how to do. Unless one reaches a critical mass of information concerning forming string figures, there is a fading of the memory of the physicality of the making of them. Thus, what I teach has to be practiced as a code for parts of the physical dance of making string figures, and these codes must be memorized and practiced until alternative patterns can be triggered by imagining the simple code alone. To do this you must memorize a simple multiplication table so it becomes indelible. Strangely enough this doesn’t take long and is fun to do. My sense of giving advice to young people so they can learn things better is to practice learning using string figures in order for them to figure out their best way to learn. I have put together some practice modes of thought to give a sense of how things are learned when a pattern is practiced. You can make up your own practice patterns and even make up you own systems of practicing. That’s all to the good (and might be learned by someone else as an easy way for them to learn). You should try to find a way to become your best and you should help others who are trying to learn along with you. And I think we all want to do our best, and if you like making the figures, they will help you find the way to be your best. You see, I think you are like everyone else. You want to be good at things– to do things well. And you want to learn how to do things so you can do them like everyone else. So you will listen to what I say– and begin to practice strings– and begin to practice thinking. You should practice what your eyes see, what your hands feel, and your ears should hear the code-words you use. All these mind activities should be made automatic and fully integrated for the unconscious ease of thinking to occur, before the system becomes a language, your own special language of the hands and imagination. Arithmetic and math itself (which is different from arithmetic) can be learned by practice, and that’s the way it’s most often taught. However, there sometimes isn’t any fun involved with practicing it, and too often the teacher makes it seem like torture. That said, you can make it a game that is fun and quickly become very good at it. The trick is to find a game that you will practice until you get to be very good at it. You should then make it a point to teach string figures to others, your younger friends or relatives, or your fathers and mothers. Teaching someone else how to make the figures shows you more than any other way how hard it is to describe how to do something you’ve learned to do, that you’ve practiced until doing it, thinking in and with it by doing it easily and well, until it is automatic and not processed by thought; but is only the flow of fingered/image thought; how truly complex it is. You have to take their hands and show them what to do. You will be surprised most, I think, at how much you know that they don’t, and how much you have learned. I was a good student when I was young, at least in the grades that I got. However, I didn’t study. I found out that if I helped my classmates to learn what had to be learned – in short, if I taught them – then I learned what to do very easily by imagining how they should practice the information in order to remember it. That is one of the reasons I have become a teacher, but probably not the most important one. The real reason I try to teach the young how to learn and to prosper in school is because of what that positive experience can mean in self-esteem and proper preparation for a full adult life. It makes you want to be competent enough that you quickly learn how to find your own way. And finding your own way and learning to take care of yourself as well as you can is what life is all about. That is what you should try to learn when you teach others how to make string figures.